Swift UVOT Serendipitous Source Catalogue - Breeveld et al. Version 1.1 of the Swift UVOT Serendipitous Source Catalogue (UVOTSSC) has been produced by processing the data obtained from the Swift Ultraviolet and Optical Telescope (UVOT) between 10th Jan 2005 and 1st Oct 2010. The data processing was performed at the Mullard Space Science Laboratory (MSSL, University College London, U.K.) using Swift FTOOLS from NASA’s High Energy Astrophysics Software (HEASOFT), with some customizing of the UVOT packages in order to get more complete source detection and to apply quality flags to the sources. The catalogue contains positions, photometry in three UV and three optical bands, morphological information and quality flags. 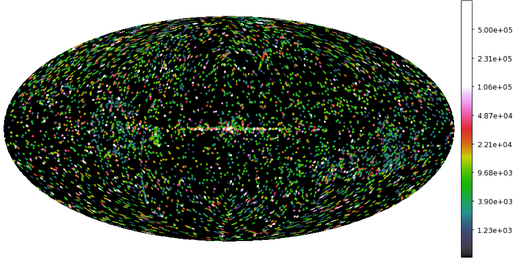 The total number of observations included in the catalogue is 23,059, giving 6,200,016 sources of which 2,027,265 have multiple entries in the source table because they have been detected in more than one observation. See Page et al. (2015) for a full description. You can refer to the full collection of UVOTSSC data products using the DOI https://doi.org/10.17909/t9-h7st-r146. 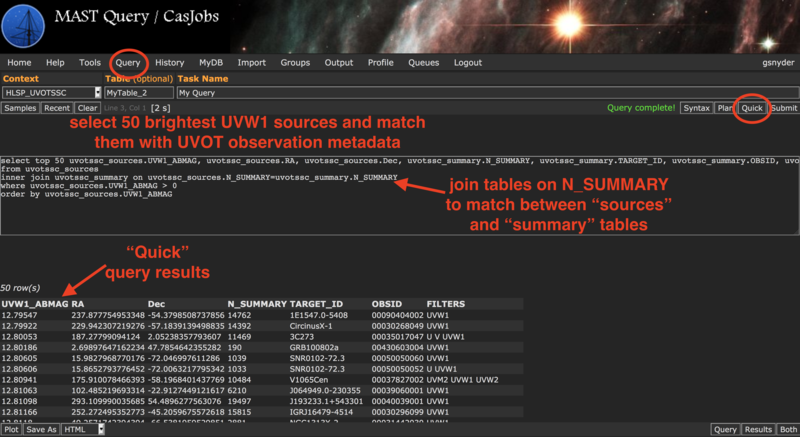 The UVOTSSC catalog is stored as two tables "Sources" and "Summary". The Sources table includes individual source detections, and N_SUMMARY matches each source to an index into the Summary table, which contains information about individual observations which may contain multiple sources. The UVOTSSC catalogs are available in MAST CasJobs, allowing for SQL queries and joins against other catalog holdings. In particular, this can be used to quickly match the sources table with the summary table. To get started, from the "Query" tab, select "HLSP_UVOTSSC" from the Context drop-down menu. You can then enter your query. For short queries that execute in less than 60 seconds, you can hit the "Quick" button and the results of your query will be displayed below, where you can export them as needed. For longer queries, you can select into an output table (otherwise a default like MyDB.MyTable will be used), hit the "Submit" button, and when finished your output table will be available in the MyDB tab. 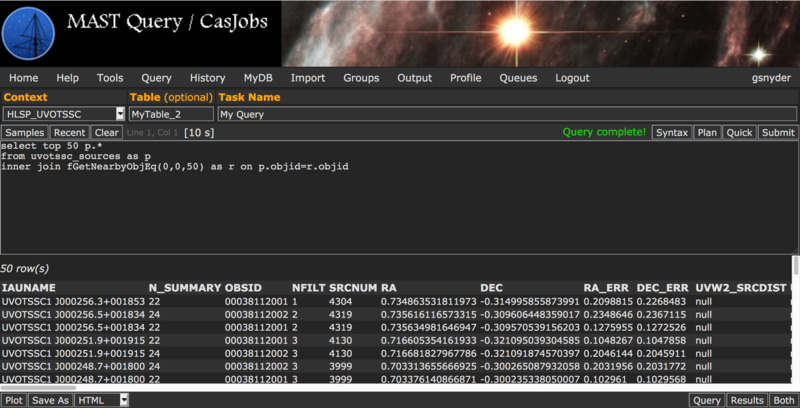 Example CasJobs Query In this example, we are doing a simple query to get a subset of columns from both the Sources and Summary tables, for the 50 brightest UVW1 sources. Perform a cone search In this example, we perform a simple cone search within 50 arcminutes around RA=0, Dec=0.